On this 31st day of our journey with the Cèlts to the Crèche, we meet St. Non, whose name means “nun.” She was the mother of the patron saint of Wales, St. David (Dewi Sant). She died about 589 AD. She may have been a daughter or granddaughter of Brychan, king of Brecon in South Wales. Legend says that Non was a virgin and was raped by Sant, the King of Ceredigion. She became pregnant with David. Another story states that Non stopped into a local church to get a blessing for the upcoming birth. When the preacher found himself unable to preach in the presence of her unborn child, this was taken as a sign that the child would himself be a great preacher. You may desire to continue reading more about Non or go on to the Meditation towards the end of this page. Chapel: Non’s chapel stands near the original Celtic foundations on a cliff top overlooking the gorgeous St. Non’s Bay, about a mile south of St. David’s Cathedral in Pembrokeshire. 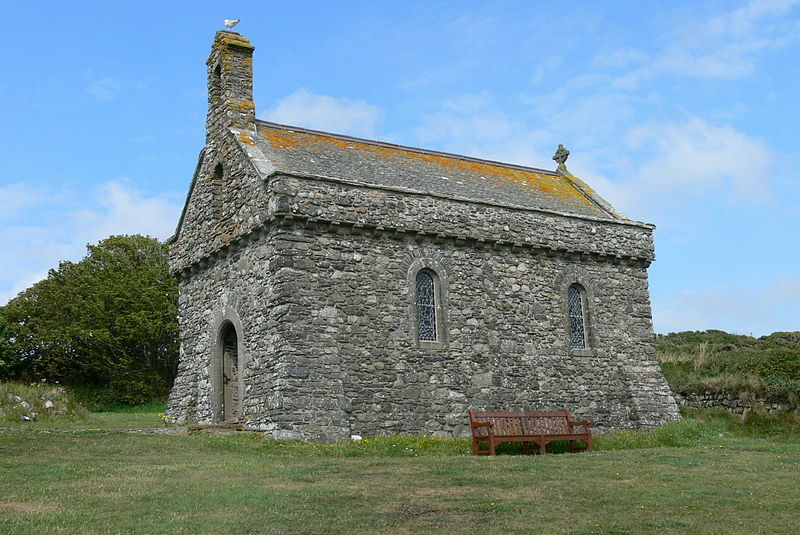 The chapel along with St. Non’s Well is located on the Pembrokeshire Coastal Walk. Very close by St. Non’s Holy Well, a St. Non’s Chapel was built. Later, farmers began to dismantle St. Non’s Chapel to use for mending their stone fences, so her chapel was rebuilt in 1934. 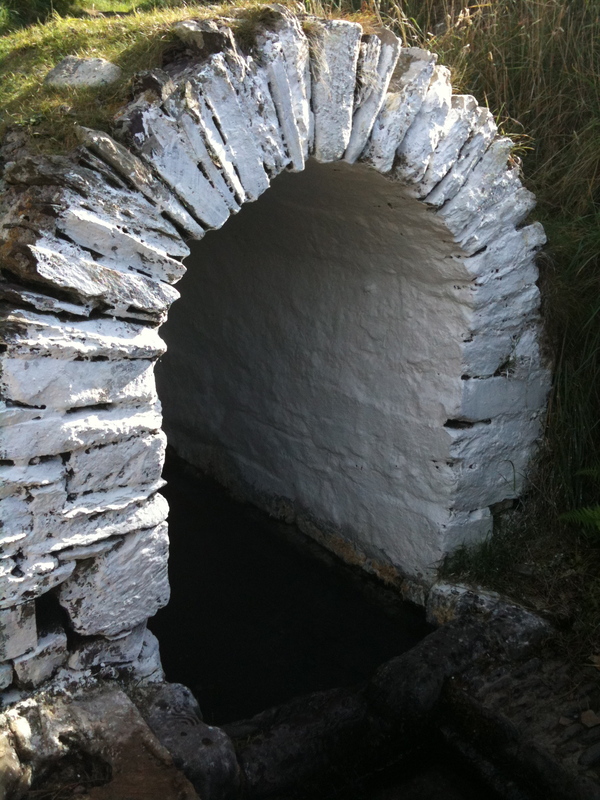 Holy Well: St. Non’s Holy Well is close to the chapel and it is considered to be one of the main healing wells in Wales as it is famous for curing eye diseases. “There is a fine Well beside it (St. Non’s Chapel), cover’d with a Stone-Roof, and enclos’d within a Wall, with Benches to sit upon round the Well. Some old simple People go still to visit this Saint at some particular Times, especially upon St. Nun’s Day (March 2nd) which they kept holy, and offer Pins, Pebbles, Etc at this well”. St. Non’s Well in Wales. I took this photo after I dipped my hands in the well in September 2009. Original location of St. Non’s Chapel before it was dismantled by farmers. Very near to the 1934 St. Non’s Chapel. Photo taken in Sept. 2009 when I visited this beautiful and serene place. Non’s Retreat Centre is on the same promontory as Non’s Chapel, well, and chapel ruins are located. They have various retreats throughout the year with accommodation. St. Non’s Retreat Centre is to the left of the photo. 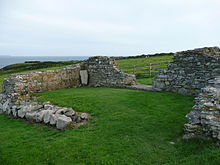 St. Non’s Chapel is the stone building near the ocean. It is a gorgeous setting. photo from St. Non’s Retreat Centre website. She is also commemorated as a holy woman not only in Wales, but also in Cornwall, England, and in Brittany. Non likely traveled to Cornwall from Wales and then onto a convent in Brittany. She is listed in the Perpetual Calendar of Cornish Saints as “Mam S. Davy.” There are at least two holy wells to St. Non in Cornwall: at Grampound and at Altarnun which was used for public displays of miraculous cures. Non died in northwestern Brittany, France and is buried at Dirinon, ten miles east of Brest in Brittany. What a wonderful example Non’s life is of God turning something horrible in our life into something that blesses and transforms the world. As we journey with Non, a Welsh Celtic saint to the crèche, let us take the truth deep into our souls that Christ can make all things new. That even the worst thing in our life can be transformed by the Creator Spirit into something beautiful and sacred and lovely. Prayer: O Christ of the Universe, you know the deepest, darkest, most painful place of my soul. Shine the light of the Star of Bethlehem into that secret sanctuary that only You and I know about and may healing begin. Amen. Evans, J Wyn and Jonathan Wooding. St. David of Wales: Cult, Church, and Nation. (Studies in Celtic History, v. 24).Rochester, NY: Boydell Press, 2007. Fish, Sarah. The Female Saints of Cornwall. MA Celtic Studies Dissertation. University of Wales. Trinity St. David. n.d.
Gregory, Donald. Country Churchyards in Wales. Gwynedd, Wales: Gwasg Carreg Gwalch, 1991. L’Abbe Sionett. Buhez Santez Nonn ou Vie de Sainte Nonne. Paris: Merlin, 1837. L’église Sainte-Nonne. Dirinon, Brittany, France. Orme, Nicholas. The Saints of Cornwall. Oxford, UK: Oxford University Press, 2000. Pembrokeshire Coast Path National Trail. Rhygyfarch. Life of St. David. In Life of St. David in Lives of the Celtic Saints, edited by Eleanor Hull. Available at Archive.org. St. Non’s Retreat Centre, Wales. “The Life of St. David” by Rhygyfarch in Celtic Spirituality, ed. by Oliver Davies and Thomas O’ Loughlin. Mahwah, NJ: Paulist Press, 2000. Williams, Peter. The Sacred Wells of Wales: A Tour. No publisher info. 2001. This entry was posted in Uncategorized and tagged 40 day Celtic Advent devotional, Advent Devotional, Brittany, Celtic Advent Devotional, Celtic Saints, Celts to the Creche, Dewi Sant, Dirinon, France, L'eglise Sainte Nonne, Mother of St. David of Wales, Online Advent Devotional, Sainte Nonne, St. David, St. David of Wales, St. Non, St. Non's Chapel, St. Non's Well, Welsh Saints. Bookmark the permalink.